Unbalanced flow is plastic completely filling some flow paths in the mold before other flow paths have filled. Unbalanced flow can be the cause of many molding problems such as flashing, short shots, high cycle time, density differences throughout the part, warpage, air traps and extra weld lines. Flow is balanced when all the extremities of the mold fill at the same time. To recognize unbalanced flow, you need to recognize the different flow paths in the mold. These are the different routes that the plastic takes throughout the cavity. The following part contains three fundamental flow paths (shown as red arrows). Each flow path is of a different length. Therefore, if the part has uniform thickness, flow path 1 will fill first, followed by flow path 2, followed by flow path 3. The key result used to identify unbalanced flow is the fill time result. By altering the thickness of regions within the part, flow can be hastened or delayed in certain directions to help balance flows. In the above diagram, varying the part thickness and creating flow leaders and deflectors, thinning flow path 1 and thickening flow path 3, is the answer. These variations in thickness are known as Flow Leaders or Flow Deflectors. In other examples it is often necessary to consider the position of the polymer injection location, or the number of polymer injection locations. For example, if you choose a single injection location that defines some flow paths to be three or four times the length of others, then it is almost impossible to balance flows. Try moving the polymer injection location to a position that will define similar length flow paths. Alternatively, visualize the cavity in smaller, more manageable sections. Then use multiple injection locations, one per sub-section. The temperature at the end of fill shows uniform distribution in each cavity, predicting uniform shrinkage, and acceptable weld line quality. 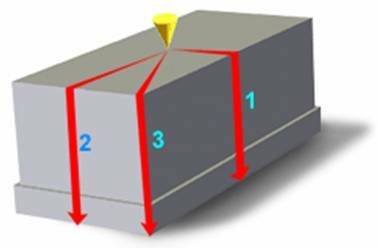 The shear stress in each cavity (ignore runners) is less than the recommended limit for the material chosen.